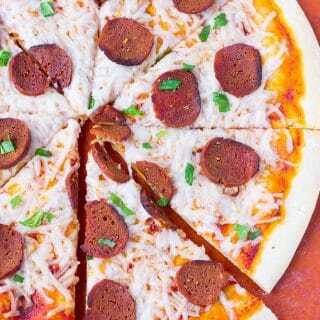 Easy vegan pepperoni recipe made with vital wheat gluten flour (seitan) and the perfect blend of spices! Perfect on pizza, sandwiches or on a vegan appetizer platter with crackers and dairy free cheese. I was never a huge meat eater, even in my pre-vegetarian days. But one thing I LOVED was pepperoni pizza! 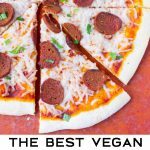 If you are like me and have been looking for a vegan way to re-create this beloved pizza, then you’ve come to the right place. 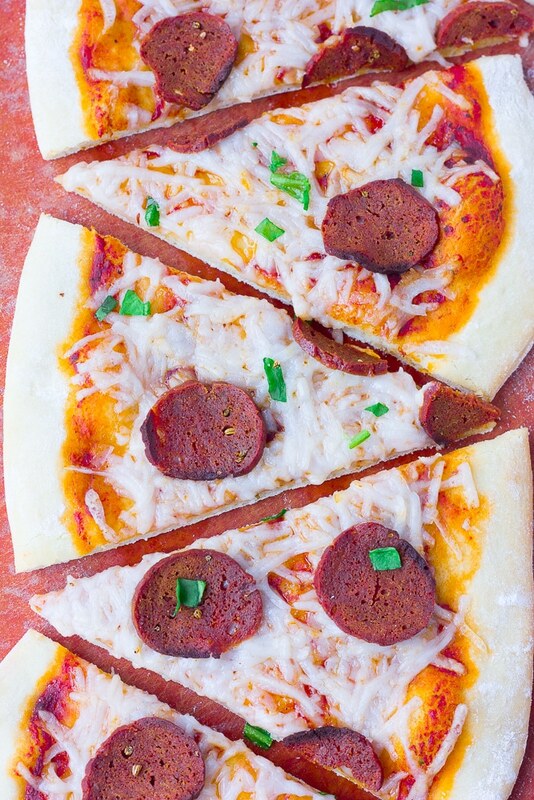 This vegan pepperoni is quite easy to make and yields a large amount, so you can either freeze some or refrigerate it to use for sandwiches and other meals. 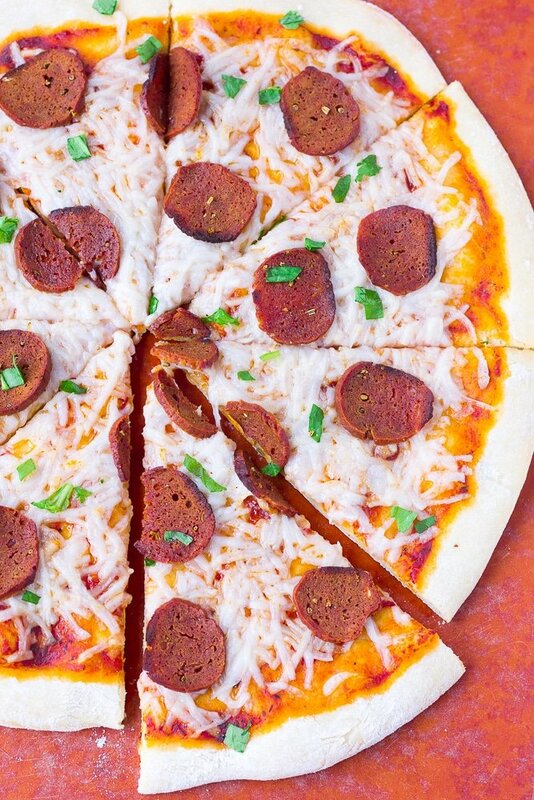 This vegan pepperoni is seitan based, and made with vital wheat gluten flour. Vital wheat gluten is the natural protein found in wheat, and is often used to make vegetarian meats, as it create a great “meaty” texture. The other ingredients in this pepperoni are various spices, nutritional yeast, water and tomato paste! The spice mix is what really brings the flavors to life! It’s spicy, salty, peppery and smoky. YUM. 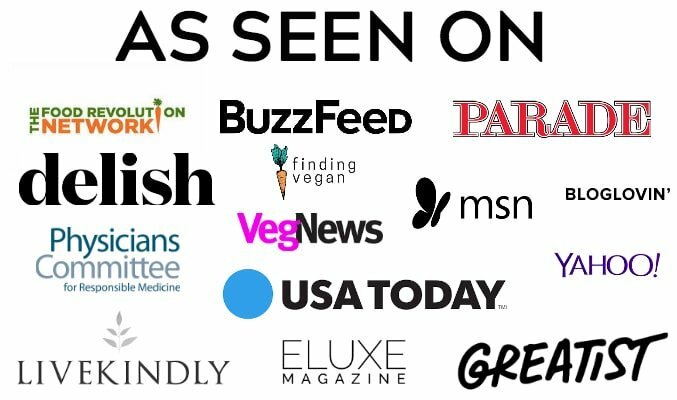 How do I make vegan pepperoni? Mix the dry ingredients together, then mix the wet ingredients together in a separate bowl. Pour wet into dry and mix, then knead the dough until smooth. Form into logs, wrap tightly in foil and bake for an hour. Let cool a few minutes, slice and top that pizza! How should I use vegan pepperoni? Pizza, of course, with vegan cheese (or try my EASY stretchy vegan mozzarella). Sandwiches- We have been enjoying this all week long on sandwiches for lunch. The kids LOVE it. Homemade Lunchables! 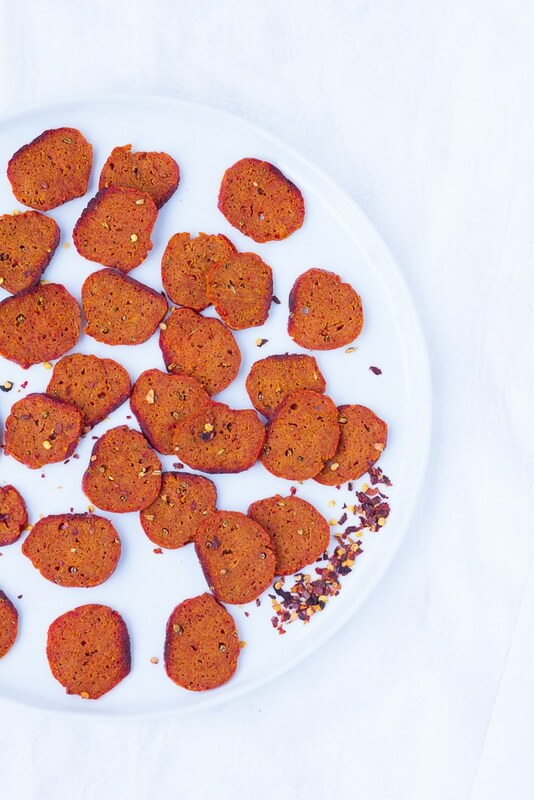 Pack your kid a fun lunch with vegan pepperoni slices, vegan cheese and crackers. Charcuterie board for parties- make your own fun appetizer board with this pepperoni. In a smaller bowl, whisk all the wet ingredients together until well combined. 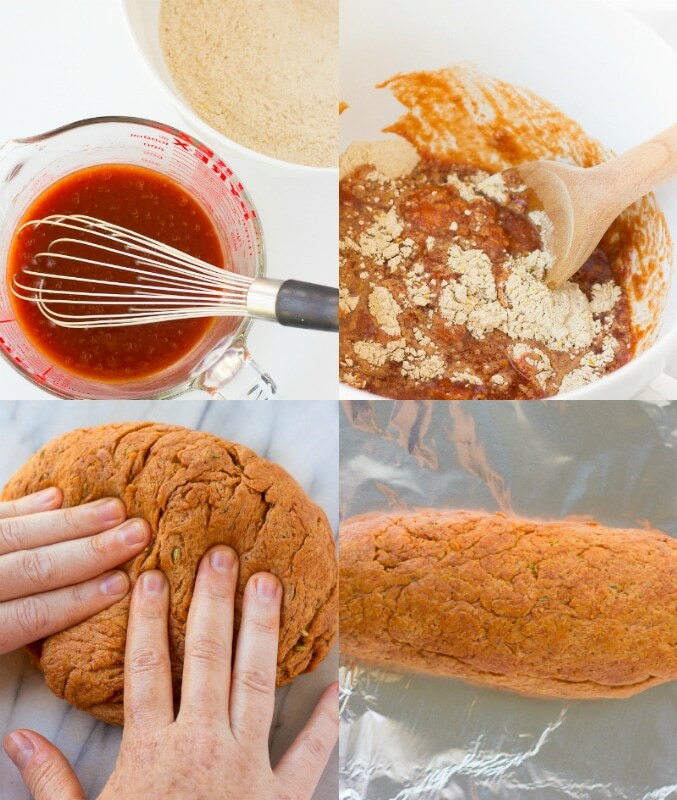 Pour the wet into the dry ingredients and mix with a large spoon until it comes together. It will be like a dough that is pretty rough at this point. Turn the dough onto a work surface and knead until smooth. Break into 3 sections and shape each section into logs about 2 inches in diameter. Wrap tightly in aluminum foil, twisting the ends to secure. Bake for 60 minutes, placing the foil-wrapped logs directly on the oven racks. Remove from oven, unwrap and let cool for 5-10 minutes. Slice the pepperoni very thin, or thicker if desired. Store extra pepperoni in an air tight container or plastic wrap. Use homemade vegan pepperoni on pizza, in calzones, sandwiches or make your kids homemade lunchables with crackers and vegan cheese squares! If you shape the log very large, you will need to cook it for closer to 90 minutes. I like to make a few small logs to make smaller pepperoni rounds. 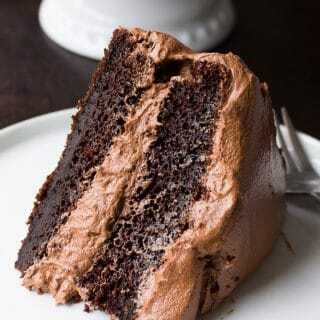 Can you let it cool longer before slicing? My knife skills are compromised. so I need to use a food processor or a mandoline. Can you use any other kind of flour? I have wheat allergy. Sorry another flour won’t work here, but I know Minimalist Baker has a gluten free pepperoni made with tofu, maybe try that recipe instead? Sorry! I love you Nora, you are so inspiring and loving! May God bless you for the great work and sacrifice that you are doing to help us, and save our precious earthlings’ lives! We #govegan #veganlife, peace and love to all the world! Animals are life! I had this pepperoni the other day and it was fantastic! I used the leftovers in sandwiches, and it was really tasty! 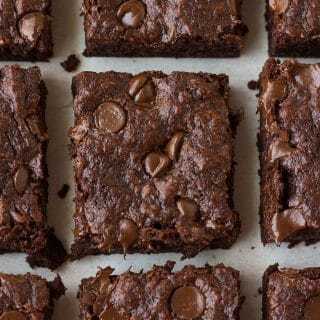 Just came across your website and have already printed out a dozen of your recipes. It’s addicting. 1/Is it better to wrap the pepperoni in parchment paper the in foil? I thought I read somewhere that cooking in foil is not a good idea. 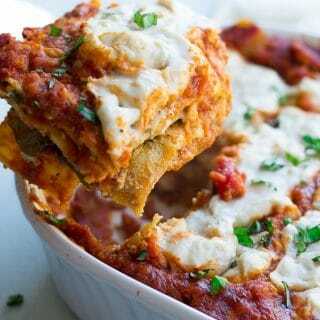 2/Have you written a cookbook? If not, you should. Thanks so much Donna, that means a lot to me! I have never tried wrapping it in parchment paper, but I don’t think it would work the same. Wrapping the pepperoni helps keep it moist and not dry out in the oven.